Is anyone else feeling like the market is more Schizophrenic than ever? Let’s get this straight: the market went straight up from the beginning of the year until January 26th and surpassed the average Wall Street Strategists yearly targets in less than a month. That’s called FOMO- the fear of missing out. Euphoria was in the air, sentiment was leaning very bullish and complacency was everywhere. There was nothing to worry about and blind risk-taking was rewarded as the market blew through its up-channel from 2009. Vertical moves are often a warning sign, think of it like the “last call for alcohol”. Then we get a “hot” wage number and markets start to fall like a rock. Euphoria turns to dismay, which turns to panic & almost in an instant. FOMO turns to FUD – fear, uncertainty, doubt. Witness some of the headlines the day before the bottom. Between the wicked oversold readings on virtually every metric we follow, the headlines showing up in every periodical, and the best indicator of them all, the CNBC “Markets in Turmoil” show, a short-term bottom was found on Friday, February 9th. That was the quickest 10%+ correction in recent memory. If you’re scratching your head and wondering what just happened…HISTORY just happened. History tends to happen when you have epic complacency and evidently, it happens faster than most of us can react. Note to self. A wise man once said buy fear, sell euphoria. We certainly had the fear on 2/9. After hitting the 200-day moving average, the market proceeded to have an epic bounce into the weekend erasing yet another 500+ point loss on the DJIA. Since last Friday, the market has gone straight up and is now nearing overbought status. So we go from FOMO to FUD and back to FOMO in 2 weeks? That’s not how healthy markets act my friends. We need to slow it down a bit, build a base and allow psychology to re-build. Lots of people are now asking: So is the coast clear? Are we done the correction and heading back to all-time highs? My crystal ball is no better than anyone else’s but I’ll answer the question using an analogy. Meet Cameron, a high school teenager whose parents frequently go out of town for work. When out of town, there’s lots of opportunity for mischief and without much consequence. Cameron’s house is the party house as you might imagine. When we take risk and get rewarded or in this case, NOT get caught, we continue to take risk, which is a self-reinforcing mechanism that lulls us into a false sense of safety. It works until…Cameron’s parents come home unexpectedly and throw everyone out. OUCH! That didn’t feel good did it? Back to what comes next. Risk-takers either go back to blind risk taking when the coast is clear or they develop new muscle memory and dial it back a bit now that they’ve felt some pain. The psychology of risk taking says it may take a few more kicks in the stomach to change behavior for more than a nanosecond. For now, we’ve had a 6% rally in less than a week and to reiterate, I’d prefer the markets slow down and build a base that leads to a more healthy and sustainable rally. Alas, the market doesn’t care what I think. Should we have been surprised by the emergence of volatility after such a quiet year of 2017? Certainly not. Did it feel good to go straight down? Definitely not. Fun fact: the last time daily VOL was as quiet as 2017 was 1964, here’s what happened in 1965. Let’s call this mean reversion. Source: Bloomberg. Bubbles, bubbles, everywhere. A cartoon from Schwab highlights the complacency and rampant speculation that’s been building in the system with easy Fed policy and ultra-low interest rates pushing people out the risk spectrum. We all need to be mindful of the signs of panic and euphoria as they offer strong opportunities when they reach the extreme stage. Let’s just hope we don’t vacillate from fear and greed on a weekly basis for the entire year of 2018. That would be unpleasant for investors and the managers of their assets. We are in the middle of Q4 earnings season and so far, so good. Per research firm Factset, as of 2/12, 74% of the S&P 500 companies have beaten EPS estimates which is above the 5-year average of 69%. Per the chart below, the S&P 500 in aggregate has reported the highest revenue growth (8%) for Q4 in six years. That’s terrific…with an asterisk: Q1 Expectations are rising and getting harder to beat and the “easy comps” could be in the rear view mirror. Stocks priced for perfection into estimates they eventually cannot beat are not usually treated well. Our focus here at Accuvest is on sustainable revenue growth, high quality balance sheets, generators of significant free cash flow and earnings that seem achievable. The 10-year treasury yield was 2.05% in early September 2017 and has been rising steadily to 2.89 where it stands today. 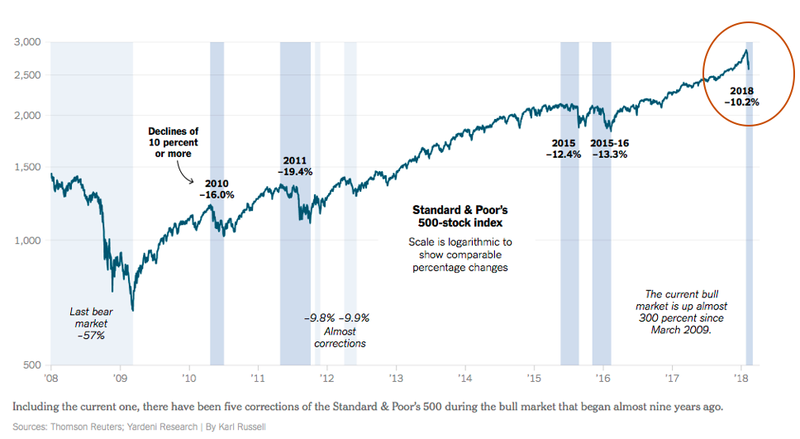 Historically, rates rising hasn’t been a problem for stocks assuming the rise is tied to accelerating economic growth and the rise is not too fast. Well, the trajectory changed at the beginning of 2018 from steady to “hurried”. That’s also something to watch. Dividend growth is our current focus with regard to interest rate sensitivity across the Brands portfolios. QUESTION: If rates are rising/growth is accelerating, why is VALUE still lagging GROWTH? Newer PostMarket Top or Rolling Correction?